It was another strong month for Sony, as its console continues to to dominate. Whoa. Big month for Nintendo, too! Glorious. The superior gaming console with superior service is doing better while releasing more exclusive titles. Even though the xbox one is cheaper the ps4 is still outselling it. With the recent news of sony winning another NPD and M$ losing titanfall 2 exclusivity i predict a cascade of pro-ms and anti -sony articles especially focussed against bloodbourne in responce! The only time X1 outsold PS4 was when PS4 was in extreme shortage and when X1 was $329 with 2-3 games and a $50 gift card. Essentially making it $199 in value. The hates already started with the release of the sales numbers. It's unfortunate that dishonest fanboys have any influence. All the consoles are great and should do well without insecure fanboys trying to influence sales. X1 price-drop officially neutralized. March will be worse. No price-drop for PS4 yet. Crazy. Congrats to Sony on the PS4s continued and impressive worldwide success. I can see 2015 being an even stronger year for the PlayStation brand with all of the great looking new exclusive games, massive 3rd party support and deep library of high quality indie titles all coming out this year. Congrats to Sony and Nintendo. And yet they're all inferior compared to PC. I really wish people would stop using the words superior and console in the same sentence. Consoles are about the convenience and the few golden exclusives you get. Not about superiority. Sales are one month old. This is news is older than my grandma. Slightly more powerful hardware? Sure but superior service? Uhhh no. Anyone who's honest with themselves knows the difference between the two services they offer. Psn is deeply flawed on some of the most basic things. I still getting a blank blue screen half of the time when I go to load the store. Still get errors when I try to send messages to all of my friends. Colin and Greg just took it to task two days ago and they are the most diehard of sony lovers. Shuhei Yoshida stopped by for an hour to play a game with them just last week but they are still honest about it. This is the problem Sony fans don't complain enough to Sony about these things so they never fix them or it takes years until they do. When something bad happens with Sony it gets blown over or barely mentioned. All the diehard fans do is praise them and rail on the competition. That's why they do Things like create proprietary over priced memory cards. Keep rolling out controllers with 4 hour battery life. Take almost two years to roll out features promised when the system was announced. I honestly feel like they could get away with anything except releasing a 600 dollar system. Ms puts so much as a lil advertisement box way down in the corner of the dashboard that you never even have to go anywhere near and it's the worst thing ever lol. Granted ms was guilty of things like this too but because they were taken to task the Xbox one has grown by leaps and bounds over just one year. I just wish some of you guys would turn some of that negativity towards Sony so they can stop coasting on your infinite goodwill and fix some if the basic things they should have fixed years ago. Yikes. So the only way the Xbone can compete with the PS4's sales in its home turf, is by selling at a reduced price and bundling it with plenty of freebies. While that's not good for the brand's image, it's great news for gamers on a budget. So expect to see more of last year's types of bundles this year. @mikeslemonade: VGchartz = the land of make believe while NPD = real reported numbers with 100% accuracy. VGchartz is ran by an Xbox fan who skews the numbers in his console of choices favor which probably means you are an Xbox fan and that is why you prefer their imaginary numbers. A big congratulations to Sony. Outselling it's closest competitor(?) despite it being $50 cheaper and giving away 2 free games. The PS4 is a great gaming console that deserves its incredibly high worldwide sales. The PlayStation brand has had some rocky roads here and there, but ultimately it has been consistently giving gamers high quality gaming experiences for the past 20 years. PSone, PS2 and PS3 all ended their respective generations strong with both quality gaming and high worldwide sales. The PS4 is on track to continue that tradition. I seem to always find the PS4 on sale almost every week at a different distributor in 2015. This week ... Groupon 360 dollar plus Last of Us free. Last week it was on Amazon with not one, not two but THREE free games. Last of Us, Killzone and Infamous for 399. I bought the PS4 in December for 330 at Walmart. Maybe the PS4 doesn't have an official sale ... but it's on sale or given with free games every single week. This is a FACT. Watch me still get disagrees. Also 9th place for the order? damn things aren't looking good for RAD. Some ppl seem to forget this is the monthly sales chart and the order was available for one week in that month. It's sold around a million world wide in 1 week, I think RAD will be pretty happy with that , especially considering the full on assault hate campaign the game had blasted at it from "journalists"
No, they haven't forgotten, they just need to say anything to make themselves feel good about the fact that they don't have anything to play till the end of the year. Does anyone have leaked numbers? Note that February is a 4 week month and March is a 5 week month (as far as NPD is concerned). So this month could be even higher. The XB1 had Titanfall last March and the PS4 has Bloodborne, MLB:TS and FF Type O (which is selling much much better on the PS4. The PS4 version is at #4 whilst the XB1 version hasn't even charted yet. I'm thinking a gap of 135k - 145k perhaps. Congratulations to Xbox One for continued growth with 84% mores sales then January. Kudos to all companies for excellent growth in gaming period. Great time to be a gamer. I am so close to buying a N3DSXL finally. It just looks so fun. Get Monster Hunter 4 Ultimate, Fire Emblem Awakening and Zelda Link Between Worlds. Mad how they include digital for Majoras mask but for non nintendo games just retail as MS and Sony don't share digital numbers to NPD. Also noticed the only games that sold more on Xbox were shooters.. Surprised?? Doubt it.. The Order came out on the 20th Feb ( NPD Coverage: February 1-28 ) So, only 1 week for The Order! Slayed by gaming journalist! In the end 9th place is NOT THAT BAD ( around 300k )! PS4 is #1 hardware but when you combine n3DS and 3DS it out sold the PS4. Not hard to get. Well, at least it's not the zombie numbers this time. Microsoft PR should get an Emmy for "the most impressive attempt to spin disappointment." "“Xbox One’s fan base continues to grow with record February sales in the U.S. for Xbox One and 84 percent more consoles sold compared to January 2015"
VERY good marketing they don't specifically say 85% more Xbox Ones. They are including 360s in that number.. They start talking about Xbox one but say 84 percent more CONSOLES sold. Very clever marketing talk by the professionals of making themselves look good even in times like these. Saying that they are still on track to outsell the 360 which is impressive. You keep on putting down the order. Your comment history makes it clear that you are anti sony. Does banging the same drum over and over make you feel good? The order only had 1 week of sales in Feb. It most likely did over a million world wide. The order has been a success. And I for one enjoyed the game. No, it's not because you are saying something that isn't to his liking, it's because you have been trolling this game for weeks and now you are coming here and deliberately spreading FUD by twisting and manipulating data in order to draw a false conclusion to suit your agenda. You are calling a game a failure off of 1 week of sales in one country and when people call you out on your BS you are acting like an innocent little girl scout and pretending to be unbiased. It is the most immature and ridiculously childish of attitudes. If you don't like the game fine, but acting like a manipulative spoiled brat is where you loose all credibility. Im sorry to all of you that keep trumpeting the order selling one million copies, if it had sold 1 million copies sony would have been announcing it all over the place like they do every time any of their games hit 1 million sales. The 10th place game on that list sold 290k both digitally and physically, not based on the NPD numbers which is strictly physical, so you cannot claim it sold more then 300,000 copies accurately. And the Xbox one hit a minimum of 240000 units last month, as they sold 85percent more then January and January was over 150,000 yet home console sales declined year over year by 5%. MS sold like 80k last February, so if they had a crazy increase compared to last year, where is this 5% decline in home console sales? NPD counts Canada aswell so it is a minimum of 2 countries. You are done with it already? I plan on getting The Order 1886. With all the bad PR I decided to wait, because I believe the price will drop fast. Wish I would've done the same thing with Watchdogs. "we can safely say the order sold less than 515k but more than 290k"
It sold more than 500k in one day. Ah yeah I forget sometimes that only the US counts. My bad. You say it's not looking great for The Order based on one week of sales in one country so you must be right. I stand humbled and corrected. Ignore him dude, trolls gotta troll. Uhmmm, isn't there like 4-5 different 3DS models against just one PS4, including the very cheap 2DS? Nice try lol smh. PS4 sold over 400k last month . INCREDIBLE ! That's just new 3DS model sales. The 3DS handheld as a whole, not separated by models or variants, hit 515k I think? Ya, that sounds right. congrats to both Sony and Nintendo. Congratulations, Sony. Another great month. looks like the order wasnt that big..
Majoras mask is amazing btw. Your comparing a new IP to one of the most successful IP's for nintendo. Thats like me saying wow look Infamous Second Son sold better then Sunset Overdrive. "looks like the order wasnt that big..
Majoras mask is amazing btw." That's why there's a point at the end of the first sentence. Dude 1st of all he brought up the order saying it wasn't big meaning hes downplaying its sales. 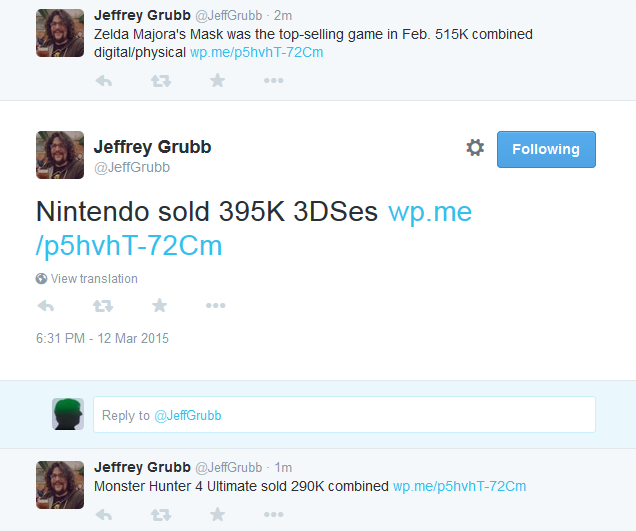 2nd off he brings up zelda because obviously it sold well so he is comparing it to the order sales. He just sugar coating it like alot of u ppl do on here. Nintendo 395k they surprised everyone did they win the NPD? PS4 have not seen results yet for it. Nintento claimed victory in the their PR statement 400k is not right. OT:glad the order made it to the top 10 even though it was released on 20 Feb.
"i am impressed know big exclusives out they do nearly 280,000 not bad "
Wow are people still going on about what sold more? Come one look at the bigger picture the Xbox one, wiiu, new 3ds and ps4 are all selling very well so far this year. Yes the PS4 is the market leader for home consoles and the 3ds is the leader in handheld but looking at the numbers it looks like we will see 3 home consoles see out this generation again which is great for the industry and with 2015 looking like a great year to own all 3 consoles just enjoy your games and support the developers who cerate the games you are into. Yes but the bigger picture is how long did the OG XB last before getting canned...and how long will the Wii-U last before Nintendo puts out a new console? Look at history and judge not just...hey look they are still all here...On a side note...Gaming is booming and I agree with you on that! OG XB was their first foray into gaming. It's an established brand now, and they'll most likely mirror generational schedules with Sony for the foreseeable future. As for Wii U, it'll last exactly 5-6 years, like clockwork. Since Nintendo released the NES, they have not missed a step with their 5-6 year home console schedule. Come hell or high water, you can bet that another console will drop in November 2017 or 2018, my guess would be 2018. Takes more to develop in HD so they'll want to milk that extra year for software sales. So there's really not any uncertainty except for that which people let themselves imagine. In reality though, there are no variables here. @04STIBluByU I did not say they are all still here. It has been branded saying that console gaming is on the way down but it is far from that and ALL 3 are selling well. Each gen 1 console outsells the others and that will always happen as its sales at the end of the day.